New Orleans has well deserved its superlative status in travel guides and top ten lists. From most romantic destination to best place to party, the city works hard to present itself an interesting and inviting city. When operating within a tourism economy, the standards regarding entertainment are tremendously high; locally owned restaurants, bars, and music venues have to offer something spectacular in order to remain in business despite increasing competition. Our specific area of study focuses on 23 restaurants (excluding national chains such as Domino’s and Quizno’s) grouped within an area a little less than one square mile. For example, there are no less than five restaurants serving pizza within spitting distance of each other. In theory, such drastically intensified competition would drive potential businesses away, however, the clustered nature seems to have the opposite effect. New restaurants are continuously opening in and around the area, while many of the restaurants we are studying have been in operation for decades. The primary purpose of this project is to study what makes this particular intersection so desirable to restaurant owners. Is there a relationship between the restaurants within the area? How do the excluded ‘fast food’ restaurants factor into these queries? How do the post-Katrina restaurants fare in relation to those with historical ties? Is there a relationship between ‘the restaurant row’ and the surrounding neighborhood? Do these restaurants have an influence outside of mid-city? What, if any, specific audience do these restaurants cater to? Are they attracting more locals or tourists? With better understanding the connections within the area, we can better speculate how new development will change things. Construction will soon begin on “the last dead strip” located in the 300 and 400 blocks of North Carrolton Avenue. 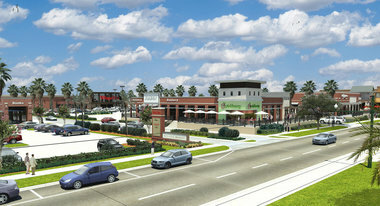 The proposed Mid-City Market will incorporate four new restaurants into the area- Pei Wei Asian Diner, Pinkberry frozen yogurt, Felipe’s taqueria, and Five Guys burgers and fries. Each of these restaurants are national chains and have no direct connection to the city, and many fear that the increasing amount of chain restaurants will cripple the individuality of the existing restaurants. However, in conjunction with The Lafitte Corridor project, the surge of new development will inevitably attract more visitors and locals alike to the area. Our project aims to determine how these developments will impact the delicate ecology of the restaurant row. Moving on! For my portion of the project, I will be writing about Cafe Minh and Angelo Brocato’s along with my research partner, Chelsea Hines. Being that this is a revisited project, the history of Cafe Minh has already been covered, and is accessible here. 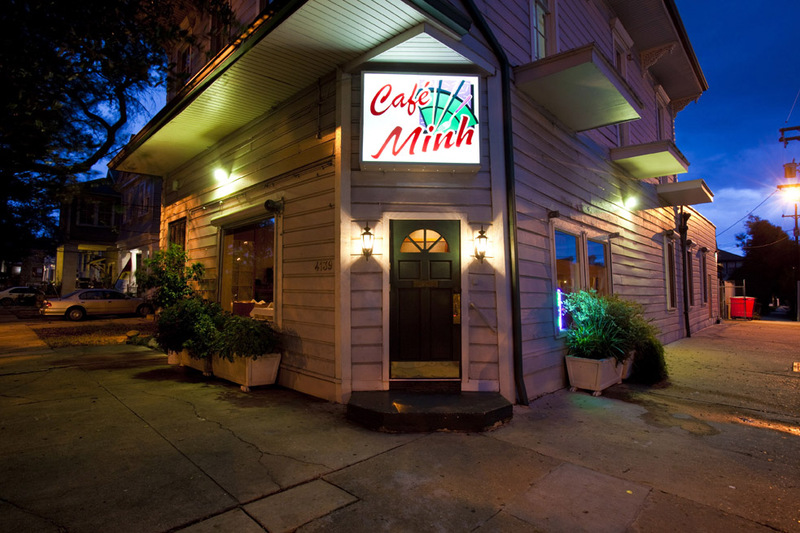 Cafe Minh is located at the corner of Canal and David, therefore removing it from direct spotlight. With only a small sign hanging above the door, it can be difficult to differentiate Cafe Minh as a restaurant from the surrounding homes. With the exception of the large windows, it appears that the exterior of the building was not renovated at all; Porch lights still illuminate the front step. On the contrary, the interior of the restaurant was very clean and modern. The decorations seemed to be purchased wholesale from an IKEA-type store. Poster sized prints of flowers and butterflies lined the walls, mixed with hazy black and white scenes of New Orleans more frequently seen in tourist brochures. In accord with the large, illuminating windows, smooth jazz soundtrack, and freshly cut flowers arrangements the place felt more like an art gallery than an Asian-fusion restaurant. We arrived late for lunch, and only a few tables were occupied. The apparent crowd was that of business professionals on a break for lunch. The staff was exceptionally friendly, and over the course of our lunch three different servers (not including our own) refilled our drinks. Being a picky eater, I ordered only jasmine rice, while Chelsea got the duck soup. Chelsea, along with the general population of yelp, said that the food was plentiful, though not fantastic, and therefore not quite worth the price. Many reviews from locals claim that the quality of the food has decreased over the years, while reviews were more favorable from people who were visiting from out of town. In my opinion, Cafe Minh is one restaurant that could potentially be negatively affected by the Mid-City market development. For one, neither the décor nor the food itself particularly stood out. The cost of an entrée put Cafe Minh out of the price range to be a neighborhood favorite, while the prints along the walls seemed more relevant to pleasing tourists than drawing in locals. Although, in theory, Cafe Minh has the perfect formula in place for pleasing visitors, its location makes it easy to miss. In its defense, Cafe Minh is one of the few restaurants in our area of study that offer the white linnen experience, and the only of it’s genre do so. Those who are just looking for a quick meal between office hours, or a cheap bowl of soup might be drawn more towards Pei Wei. Cafe Minh is the perfect venue for a date or a formal meeting, but it isn’t the type of place that you can bike to in the heat of the summer without feeling smelly and out of place.